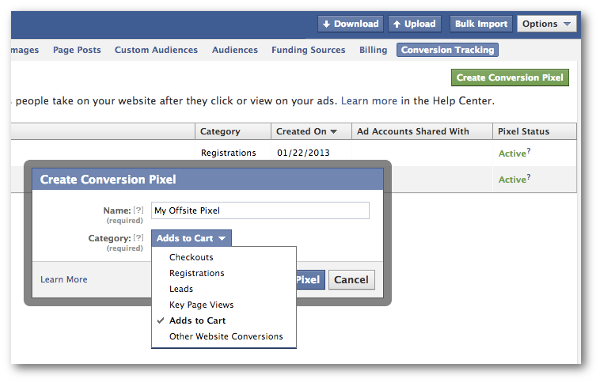 One of my favorite advertising features is Facebook Conversion Tracking. And it shouldn’t surprise you that you can only access this feature within Power Editor (my baby). Jon, first, you truly stand out when it comes to consulting and Facebook Marketing, and I enjoy following you very much. Here’s the question, and one we are going to test within Power Editor. Question: How can you use conversion tracking successfully to a site that is NOT ecommerce related? For example, conversion tracking for email sign up, form, apps, etc… Thanks. I guess it never hurts to begin a question with a bunch of ego stroking. Nicely done, Scott. Nicely done. Before we get going here, it’s important to step back and explain this amazing feature that you are very likely neglecting. Facebook Conversion Tracking is the ability to track whether or not your Facebook ad led to a conversion on your website. Are you seriously asking this? Yeah, it’s valuable. Facebook Conversion Tracking is valuable because it provides the ability to measure the true ROI of a campaign based on cost per conversion (with the help of the new ad reports!). It’s also valuable because it allows Facebook to optimize your ad for a specific conversion, targeting at people most likely to perform that action. Those things are valuable, right?? If you haven’t read my tutorial on this, make sure you do so (or you could also sign up for my Power Editor training course!). 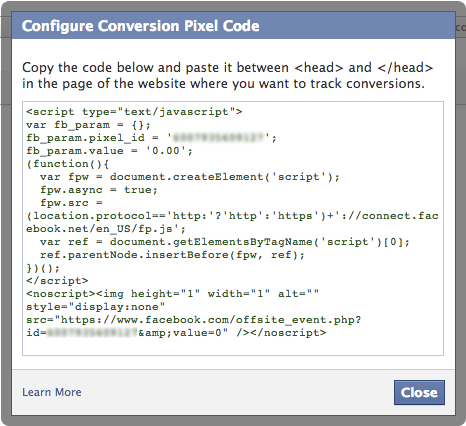 Facebook provides a snippet of code (also known as an Offsite Pixel) that an advertiser places between the HEAD tags of the conversion success page on their website (“Thank you for your purchase!”). Facebook then knows that when a user who also clicks on your ad saw that success page, a conversion was the result of your ad. When people think of “conversions,” actions like Checkouts and Adds to Cart come to mind — the things that result in a payment. When you create an Offsite Pixel, you can select any of these types of conversions (along with Checkouts and Adds to Cart, of course). So let’s assume that you have a landing page on your website dedicated to increasing leads (a contact form) or building your email list (an email subscription form). You want to drive traffic to it with Facebook ads. You’ll create an Offsite Pixel for this, optimizing for either Registrations or Leads. That pixel will then need to go between the HEAD tags (or within a tracking code box of your CMS) on the success page. This is critical. It shouldn’t go on the page where you collect information, but on the one that indicates a conversion was completed (a “Thank You” in most cases). Now, you probably use a third party tool to collect email addresses and potentially complete contact forms. Make sure, though, that you have those tools redirect to a page within your control when the conversion is complete. This can be easily missed because most email tools, for example, have a default redirect page on their own servers. You need to change this! Another issue to consider is double opt-ins for email list subscriptions. You’ll want the pixel to go on the page immediately following the form completion, not the email confirmation. I find most success getting conversions by targeting my Fans. You probably will, too, if they are a highly qualified group. Create a Facebook post (or unpublished post) targeted at your Fans. Then turn it into an ad (with Power Editor, of course) reaching them mainly in the News Feed. News Feed isn’t required, of course. But that tends to provide the best results. I’m glad I received this question. No matter how big or small the conversion, you need to use Conversion Tracking when driving ads to your website with that goal. The result: You’ll waste less money and have a much better sense of ROI for your campaign.